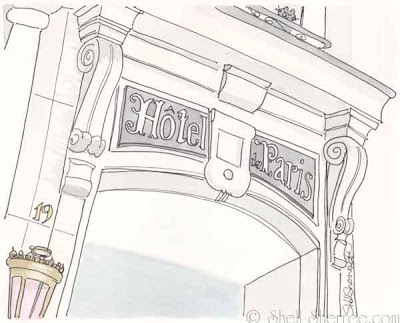 Francophile Friday: Hôtel de Paris de Paris? Update: Thanks to dear Genie of Paris & Beyond, the mystery has been solved. Now called Hotel Paris Rivoli, this beautiful spot is located at 19, rue de Rivoli, Paris 75004. I think Petrea or Virginia might know. Is Alabama Virginia a regular here? I was looking at the thumbnails. I was drawn (pun) to the light posts. I really like the composition with perspective of the statuary off to the right. PA ~ and thank you regarding the lamp posts ~ those thumbnails change around, but I have a feeling this Venerdi in Venice illustration is the one you're talking about. i don't care where it is... you're nailed it - looks perfectly lovely to me and i'll gladly have a drink or two inside! looking forward to your 301st post - yay! I took the train from Paris to Monte Carlo, but preferred to stay some place, uhm, small and exclusive. 300 posts? Well that's 300 gifts you've given us. The Alta-Hiker has been to Paris, to Monte Carlo, to places the resta us can only dream. But where did she prefer to stay & live? Ahem, Altadena. So small & exclusive it doesn't even have, or want, a mayor. That tells u how much she knows of the world. Congrats on 300! ShShe, here's to 300 more at least. It's driving me a little nuts that I can't figure out where this Hotel de Paris is—and I've even checked out the one in Varanasi! I love this black-and-white drawing, Shell—but also that you added a little touch of pink and gold. And there's a bottle of Prosecco waiting in the fridge for your 301st post! Oh, I wouldn't know about a place like this. Like Hiker, I stick to the small, exclusive places. I'll tell you what: I'll send this link to Jilly of Monte Carlo Daily Photo and see what she thinks. For the fete, might I recommend macaroons? I know you love them. Dear V ~ if you haven't seen it, it can't be in Paris! Hiker ~ thank you. And I was driven through Monte Carlo by my maniac-driver boyfriend at the time, so I had to close my eyes for most of it. Cafe ~ Hiker clearly has outstanding taste, and a town with no mayor must be almost as peaceful as a town with no sheriff. Alexa ~ I'm even more curious about it now. And grazie, bella, I'll look forward to sharing that prosecco next week! Thanks, Ms M! I've just finished letterpressing Hugh's invite and the carrier pigeon is refreshed and ready to go. Petrea ~ oh, good thinking! Thank you. Margaret ~ more good thinking. There's something sensible in the water in your neck of the woods. Sorry meant to say - thanks to Petrea who asked me. I love this B&W illustration, with the hint of pink that got you thinking of éclairs! I guess Kitty looks smug because she knows where this hotel is located. It might be in Paris, but I've never seen it. I do know of a Hotel de Paris in England, but I can't remember if they had a door like this (as I was looking down taking a photo of the Hotel de Paris mosaic entryway). I took the train around Europe when I was 19 with nothing but a backpack filled with jeans and t-shirts and dirty socks. Maybe it's time for another more fashionable train trip! Oh well, maybe this is the England one. I love traveling by train. It's so romantic, a perfect companion to your B&W infatuation. I was hoping that 19 in your lovely illo would give a hint to this hotel's locale, but alas, that search led nowhere. Just as well: the mystery adds to the romance. Congrats on your 300th post! I look forward to many, many more. Mystery solved! This is at 19, rue de Rivoli, Paris 75004. It is now called Hotel Paris Rivoli. This is a beautiful representation of this centrally located hotel. However, I just bet that they do not have a precious kitty peering down from le premier étage! Somehow, your black and white hints softly at colour, as though rose pink were just waiting in the wings ready to make a grand entrance. What dignified beauty. Jilly ~ thanks so much for responding and for your help! Petrea's very wise, so it was no surprise when she had the brilliant idea of checking with you. Katie & Mise ~ I'm glad the blushy hint of pink comes through. Sometimes scanning loses a little of the magic. Or maybe you all have extrasensory pink perception... whatever the cause, I'm happy. Genie, bless you!! You've saved us all some sleepless nights. I wonder what it's like inside ~ I feel I need to add it to my list of possible places to stay. I also feel I'd better make an Ella toy to take with me. Still - some pomp and circumstance would be very appropriate - and you could throw in a reference to two about a certain golden jubilee to go with that pomp and circ. Now, what could that be called? Fanfare Friday?